Pharmaceutical Asset Tracking for Regulatory Compliance, Minimal Waste, Maximum Productivity, Increased Product Quality and a Faster Speed to Market, Resulting in Excellent Brand Reputation and a Healthier Bottom Line. NFC’s pharmaceutical asset solutions incorporating RFID, GPS and IoT technologies with real time feedback over the Orion data network, remotely monitor pharmaceutical equipment, drug components and your end products. The system allows you to create predictive models and perform diagnostics across your pharmaceutical asset portfolio at every point in your supply chain. As the pharmaceutical industry continues to make scientific breakthroughs, the majority of drugs contain biologic or live components, that degrade very quickly if they’re not kept at a certain and constant temperature. Globalisation means that your pharmaceuticals and components may travel through several different countries with varying terrains and ecosystems where the temperature fluctuates a great deal. If you require your components to remain at a temperature of 35-77°F then you need a reliable system that not only maintains the temperature, but also immediately notifies you if it fluctuates so you can take action to preserve your assets. In terms of transporting these components and the end pharmaceutical product, the cold chain logistics industry is expected to reach $36 billion globally by 2019. Currently around 20% of pharmaceutical product are reportedly wasted in the global supply chain and in warehouses due to inefficient storage at the wrong temperatures. Our Orion Data Network Pharmaceutical Solutions constantly measure the temperature in all the microcosms that your assets pass through in your supply chain, such as your warehouse, cold storage and shipping containers. You can passively track the temperature at all times but, as soon as there is a fluctuation, the system instantly messages you with an alert to your mobile, so you can save your assets. The GPS-enabled tags also notify you of the location of your pharmaceutical assets at all times to protect them from loss, damage and theft. The real-time data Orion that provides to your Pharmaceutical business, paves the way for you to become both data and insights driven. Information on equipment availability, calibration and usage means your manufacturing teams can make properly informed business decisions that align not just to business goals, but also to what is genuinely going on at ground level in your business. Your equipment will be used properly and perform better and there will be less outage and downtime. In this way Orion helps increase your product quality and speed to market while also lowering your manufacturing costs and freeing up budget to be spent elsewhere. Orion integrates readily with legacy and third-party systems and is quick and easy to set up so there is no long lead in time and you can start benefiting from your asset tracking and real-time data Immediately. We can either create an end-to-end Pharmaceutical asset management system for you, or we can create individual solutions to solve particular problems and make improvements in your supply chain. Orion’s real-time data on all the important aspects of your pharmaceutical assets, create smart warehouse space with excellent visibility and improved efficiency, so you can optimise the lifecycle of valuable pharmaceutical equipment, components and drugs. When the system sends an emergency report on the status of an asset you can act immediately on these insights and take corrective measures to, for example, move an asset’s location or change the temperature of its environment. When you look at the data over a period of time you can see bottlenecks in your supply chain and processes that can be ironed out, bringing long term business efficiencies. 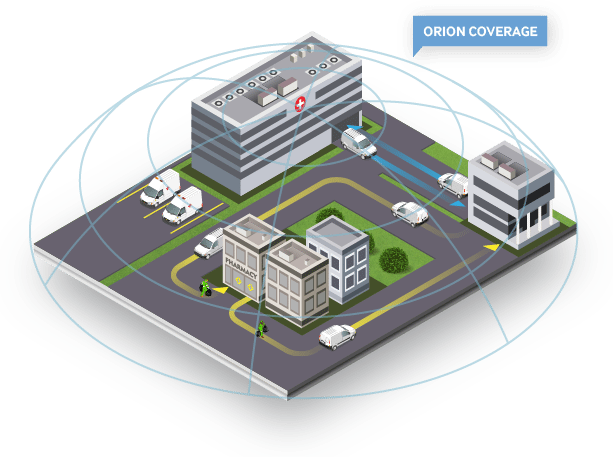 Orion offers up to 75% better cost savings than other available pharmaceutical tracking systems. You can also benefit from savings on your insurance premiums as insurers offer rewards because Orion mitigates so many risks associated with the Pharmaceutical industry. You can choose which IoT sensors you would like attached to your pharmaceutical asset tracking tags so you can track volume, weight, location, moisture, temperature, pressure, tilt, tamper, movement, shock and much more. Increasing your operational efficiency with Orion saves money and time and has a significant impact on your bottom line so you get an excellent ROI and the system quickly pays for itself. Orion also helps you to organise and optimise your entire warehouse space. You can track your inventory at a glance, get a granular view on problem areas and organise automated pharmaceutical asset repurchasing, maintenance and retirement. Orion allows you to automate effectively so you no longer have to rely on error prone manual warehouse processes. The requirements under laws such as the US Drug Supply Chain Security Act and the EU Falsified Medicines Directive are aimed at preventing pharmaceutical counterfeiting. Assigning unique identification numbers to drugs, containers and packaging throughout the global supply chain helps pharmaceutical companies to reinforce these legal requirements and prevent criminal activities such as drug counterfeiting and theft with verification at the warehouse, shipping and pharmacy touchpoints in the supply chain. Orion enables item level serialisation and identification, prevents tampering and tracks your components and drugs throughout their lifecycle to helps you ensure that the products your partners and customers and the patient end-user receive, are authentic. The business benefits that can be realised include lower legal fees and insurance premiums and improved brand reputation. The pharmaceuticals industry is one of the most susceptible to loss due to cargo theft as there is such a huge black market for the end product drugs. Orion beings excellent supply chain visibility and security from one end of your pharmaceutical supply chain to the other. Emergency alerts to your mobile device mean you can respond to product theft instantly and track your pharmaceutical assets for faster recovery and more likelihood of arrest and conviction. Our poverty and covert tracking solutions can be used in any vehicle, vessel or aircraft to help ensure your asset security.